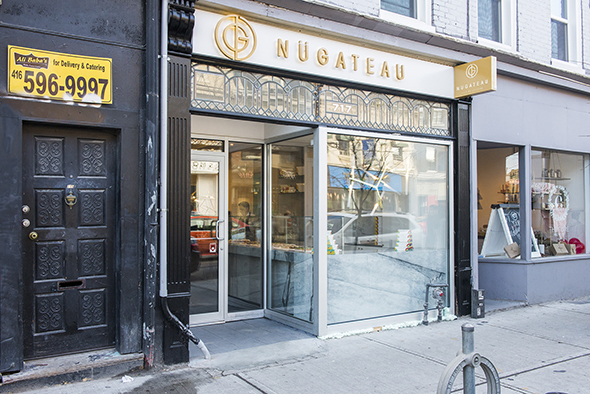 Nugateau is a the first éclair-only patisserie in Toronto. Former Jelly Modern Doughnuts pastry chef Atul Palghadmal spent months crafting a choux pastry menu that reflects the multicultural flavours of the city with a menu boasting Japanese Matcha, Brazillian Coconut, Tahitian Vanilla and Maple Bacon. 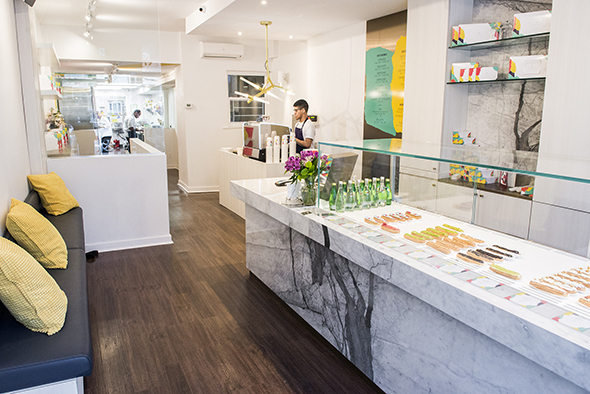 The open-concept patisserie is pristine with sparkling white walls in a pastry boutique that's like a jewellery store. 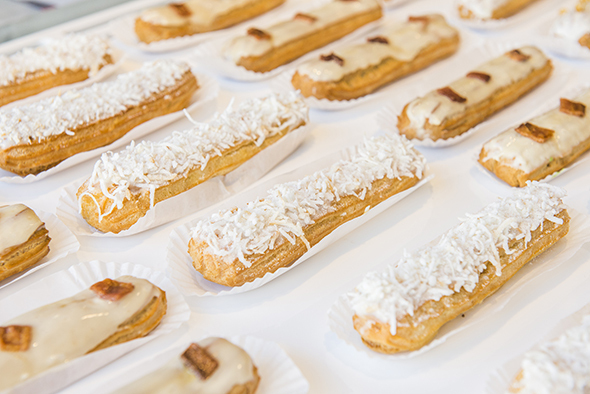 From the entrance, you can see into the kitchen, a three-person operation mixing cream fillings and topping éclairs with mouth-watering glazes. 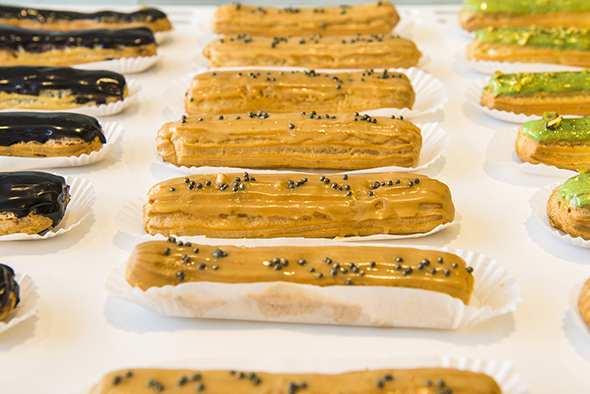 Inside a deluxe glass display, rows of éclairs are elegantly lined with vibrant hand piped toppings. 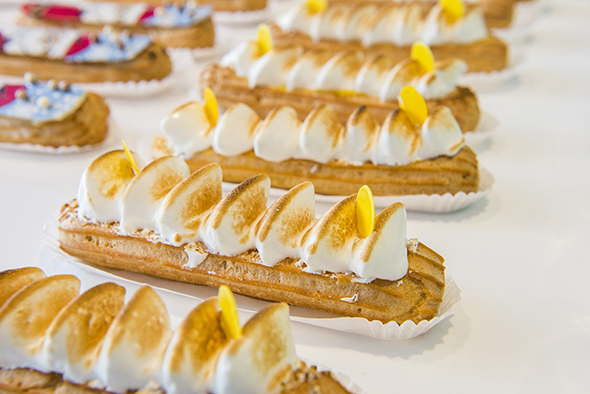 The Lemon Meringue ($5.50) is extravagant, a cream-filled pastry fit for a king. Each flavour is available in single servings ($4.50-$5.50) or packs of six ($25-$30) for an indulgent one-sitting dessert. "Our Lux Collection includes our Eggnog Santa, Red Raspberry, Persian Pistachio and Salted Caramel. 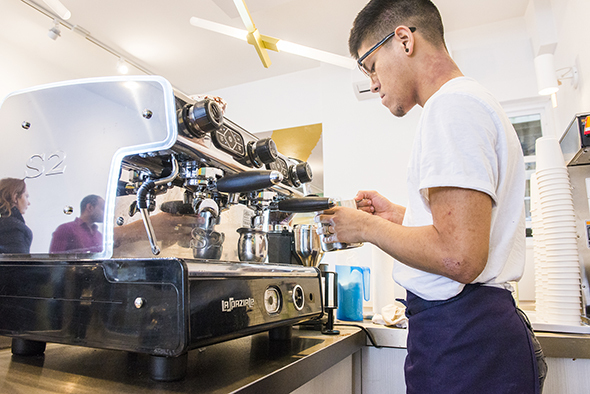 These are limited-time flavours that rotate monthly" explains owner Abm Kadir. 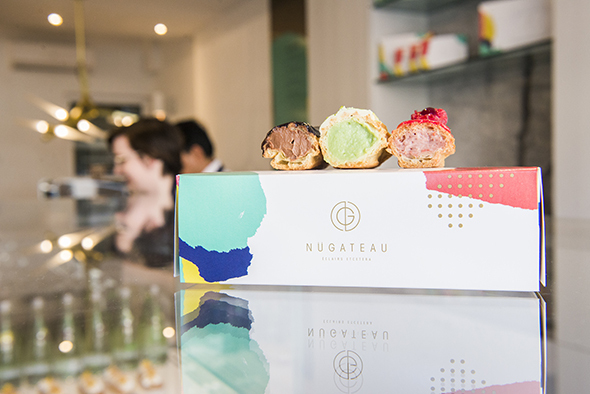 Fusing traditional French patisserie practices with contemporary taste, Nugateau is forefronting Toronto's dessert trends with savory 2016 flavours like Foie gras and lobster. Feeling fancy, I order a Persian Pistachio ($5.50) made with white chocolate pistachio cream and topped with candied pistachio. 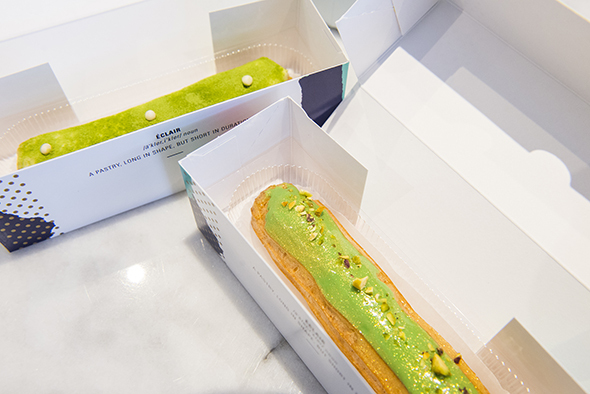 An oblong green dream, the three-bite pastry is surprisingly light with a thick blanket of rich cream. Like a gateway drug, one éclair could have easily turned into six in a matter of minutes. Dangerous, if you have a sweet tooth like me. 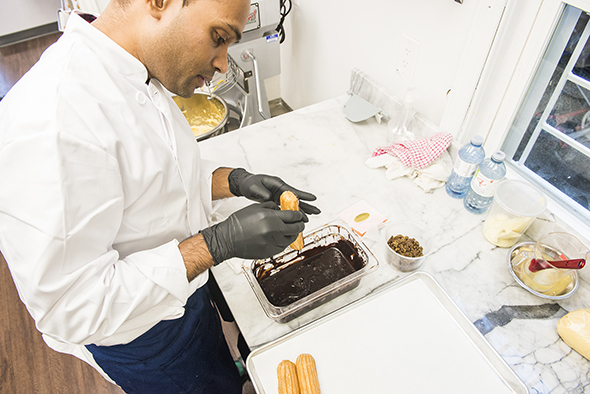 Meandering Queen West crowds can order éclairs to-go, with a specialty carrying box designed to protect éclairs like precious artifacts overseas. The boxes are compact, cute and practically bullet-proof. Nugateau also serves gourmet hot chocolate ($5), Palais De Thes teas ($3), standard hot and cold espresso-based drinks ($3-$4.75) from Alfa Cappuccino Imports. Drinks have a heavy European influence; dark, thick with rich flavour. Nugateau is a darling blend of everything Toronto stands for: A little pricey, full of itself, and totally worth visiting.